Nightmare on Elgin Street: Beckta haunted by the ghost of Dr. Grant? On a dark and stormy October night, a glimpse of Beckta restaurant — between flashes of lightening, of course — could easily be mistaken for the Addams family residence. 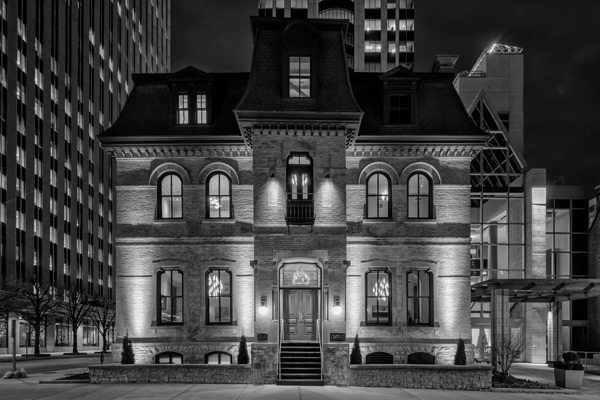 Perhaps it’s not surprising that this Ottawa landmark is rumoured to be the home of a famous ghost. Dr. James Alexander Grant built the three-storey masterpiece in 1875. A published academic, and president of the College of Surgeons of Ontario, he was said to have practiced his craft onsite, and was even rumoured to maintain a morgue in his basement. Most of the stories come from before Beckta moved in. They involved seeing a figure in the window or staff hearing coughing (Dr. Grant was both asthmatic and loved to smoke cigars). When we took occupancy, I left a glass of champagne on the mantle in an heirloom Grant family glass. It was partially gone (the next morning) and we’ve been haunting free ever since, so (Dr. Grant) likes us in his space… One time we had a problem with lights flickering and we thought it might be the ghost, but it turned out our dimmer switch was faulty. What signature drink would you serve Dr. Grant? I’d offer him a smoky cocktail, like our Smoked Butter (brown butter bourbon, vermouth, black soochong, cinnamon, mole).